The psychology of aging usually focuses upon cognitive changes, with a particular focus on dementia and other forms of cognitive decline. But getting older is about more than simply changes to the brain and related health issues. Changes to our social and emotional lives are also hugely significant as we adapt across our lifespan. 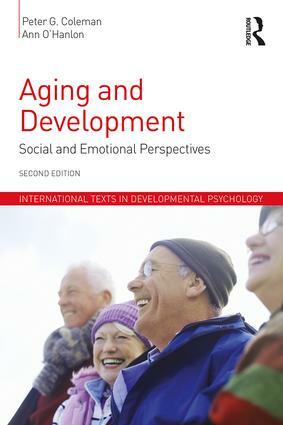 The second edition of Aging and Development is the only textbook available that responds to the growing interest in social, personal and emotional development in older age. Ideally suited to complement texts on cognitive change, the book provides a holistic developmental perspective on aging. It highlights a range of issues, including the development of personal meaning and spirituality, improvements in emotional control, uses of reminiscence and life review, the importance of healthy attitudes to aging, as well as the maintenance of close personal relationships. It does not avoid the difficult issues of late life decline, but illustrates how even in circumstances of physical and mental frailty a positive sense of self can be created and enhanced. Fully updated to provide the most cutting-edge overview on this burgeoning topic of interest, Aging and Development includes a glossary and list of useful websites both on the study of gerontology and the psychology of aging. It will be essential reading for all students of developmental psychology, as well as anyone either training to work or already working with older people. Peter G. Coleman is Emeritus Professor of Psychogerontology at the University of Southampton, UK. He has made major research contributions to the developmental study of aging, particularly in the fields of reminiscence and spirituality, and has been teaching specialist courses on aging to psychologists, social workers, doctors and other health professionals for over forty years. In 2015 he was given the ‘Outstanding Achievement Award’ of the British Society of Gerontology. Ann O'Hanlon is a psychologist and CBT therapist, who has directed several European Union projects on aging. She works in the South Eastern HSC Trust in Northern Ireland, and leads a transnational project promoting kindness initiatives at all levels of society. In 2014 she was given an Excellence Award with the British Association of Behavioural and Cognitive Psychotherapy for her work addressing social anxiety with older adults. The International Texts in Developmental Psychology series is designed to embrace the emergence of new areas and developments in the field from a global perspective, providing state-of-the-art, higher level introductions to major topic areas. Each volume is written by a specialist who combines empirical data and a synthesis of recent research to deliver cutting-edge science in a format accessible to students and researchers alike.